Rupi Kaur is my favorite. After binging on Milk and Honey of course I ran to Amazon for her second book of poetry immediately. Lucky for me, the kindle version was free for Prime members! 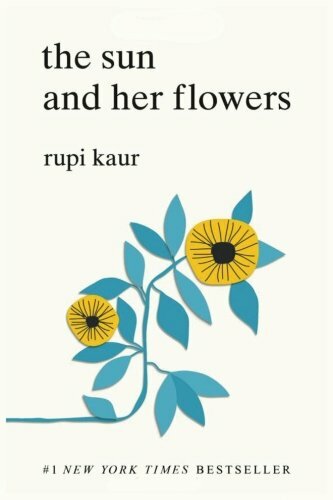 Broken into 5 parts; Wilting, Falling, Rooting, Rising, Blooming; Rupi takes the reader through various depictions of love, in all it’s many forms and stages. Her writing is not only beautiful but deeply thought provoking. She has an uncanny ability to portray so much depth in such simple sentences. Her illustrations provide the perfect accompaniment to her words in that same simple yet powerful way that I have come to expect and love. over the past week i've heard from so many of my trans readers and friends who are dismayed and heartbroken over this administration's plans to erase trans and non binary identities out of legal and policy existence. taking away the few protections that were hard-fought and won. within this administration (and most global regimes) there has been a shockingly criminal disregard toward trans. non binary. and intersex lives. this week the administration is "considering narrowly defining gender as a biological, immutable condition determined by genitalia at birth". this is a criminal disregard for the lived realities of our trans and non binary siblings. in the words of my brilliant friend @prabhdeepsk "using genetic testing for any form of social identity verification & having civil rights protections is another form of legitimating and furthering eugenics to me." why does any of this matter? because our myopic and exclusionary visions as a society have served to marginalize and remove our trans. non binary. and intersex siblings from every single fabric of society. 2017 was the deadliest year on record for transgender communities and 2018 is outpacing it. trans communities are in danger not only because of hate and gendered violence but because law enforcement and policy makers ignore trans identity. in fact law enforcement often doesn't even acknowledge trans lives as trans. in many countries repressive heads of states dehumanize endanger and legitimize attacks on trans lives. by every global and domestic metric : trans. non binary. and intersex lives are marginalized beyond comprehension. and the danger is even more apparent for trans and non binary folks of color and queer folks. in the weeks months and years to come we need to do more as a global collective to combat this avalanche of hate. here are some actionable steps: contribute directly to trans peoples in need. contribute to trans organizations. vote!!!! vote out transphobic politicians. have difficult conversations with our families and educate. don't let people's jokes and jabs about trans and queer folks slide. listen to our trans & non binary friends. check in with them. amplify their voices. These are just a few of the many many gems that resonated with me in this book. It was all deep and moving, quick snippets of inspiration that I can’t recommend enough!